Russian Sports Minister Vitaly Mutko made his point quite clear this week in a hard-hitting speech on anti-doping, following a wave of recent doping scandals involving Russian athletes. The enemy? Drugs in sports, those who take them and the coaches who supply them. Mutko did not shy away from condemning Russian athletes found doping, something other officials have sometimes seemed reluctant to do. An athlete found pumped full of banned substances is a “fool,” he said, and when a Russian champion is disqualified in the lab, “the prestige of the state” is at risk. There are big names among the Russian athletes banned this year: world swimming champion Yulia Efimova and the cyclist Denis Menchov, stripped of his second-place Tour de France finish from 2010. At this month’s European Athletics Championships, Russia is without Olympic and world race-walking champion Elena Lashmanova, who was banned for two years last month, and also her coach Viktor Chegin, who is under investigation after 18 athletes he trained tested positive. You might ask: Why not legalize doping? No tests, no results changed years later – athletes should take what they want to go as fast as they can. The problem is that many would die. At the height of cycling’s doping era, international-level riders, supposedly at the peak of fitness, dropped dead as the drug EPO caused the blood to thicken in their veins. The substance found in 22-year-old Lashmanova’s system, GW1516, provides a boost to endurance but has never been sold legally because it comes with horrifically high risks of causing cancer. He did not provide further details but his comments suggest an organized doping operation is suspected. An experimental drug such as GW1516 does not turn up in an athlete’s bloodstream by accident. If a coach or team official acquired this substance and injected it into Lashmanova, that person may have destroyed her career and put her life at risk. 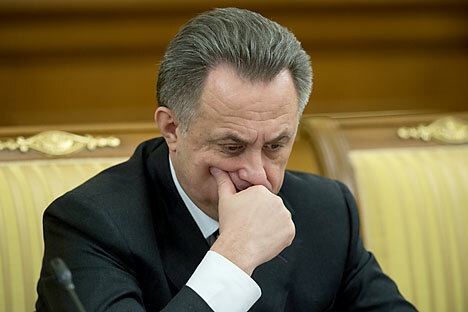 Mutko left a slightly mixed impression by describing what happened with Lashmanova as “absolute carelessness.” But his speech marked a watershed and there are positive signs – such as the lack of positive tests among Russian athletes at the Sochi Winter Olympics. Many Russian athletes may have been banned, but perhaps people will look back and mark 2014 as the year that Russia got serious about stamping out doping.